The bill — sponsored by state Reps. Edie Hooton, a Boulder Democrat, and Kim Ransom, a Littleton Republican — would add autism spectrum disorder to the list of conditions that qualify a patient to receive a medical marijuana card with a doctor’s recommendation. “What compels me to bring this bill to you is the suffering these families endure,” Hooton said. “For me, this is a parents’ rights issue,” Ransom said. “My primary concern is these decisions are being driven outside the medical home,” Caraveo said. This isn’t the first time the Colorado General Assembly is considering the legislation. Last year, a similar bill passed with ease. However, then-Gov. John Hickenlooper, citing concerns from medical professionals, vetoed it. Parents of children with autism and advocates for medical marijuana told lawmakers at the bill’s hearing that they see the treatment as their only option. Margaret Terlaje said before her son started taking medical marijuana the medicine her child’s doctor prescribed for his autism didn’t work. It also made her son drool, she said. “We’d like a chance to see if this will improve his quality of life,” she said. Like last year, the state’s medical community voiced opposition. “We don’t have enough evidence right now,” said Dr. David Downs, a former president of the Colorado Medical Society. Melissa Atchley, another mother who testified, said she didn’t care about a lack of medical evidence. “As a mom, I want my child to stop beating his head against a wall,” she said. 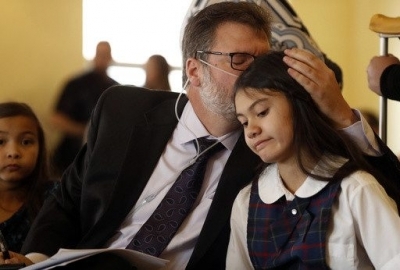 Colorado is studying the effects of medical marijuana on autism. The study, which is being paid for by marijuana tax dollars, was commissioned by Hickenlooper after he vetoed last year’s version of the bill.